Heat olive oil in a large skillet over medium heat. Add turkey, green peppers, garlic, Italian seasoning, black pepper, salt and red pepper flakes. Cook and stir until turkey is lightly browned. Stir marinara sauce and baby spinach in the turkey mixture. Cook and stir until marinara is warm through, about 3 minutes. 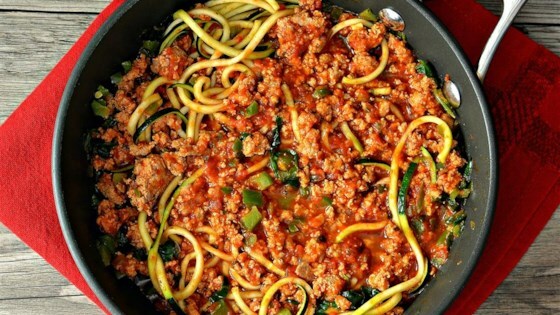 Stir zucchini noodles into sauce with tongs. Cook and stir until noodles are slightly tender.